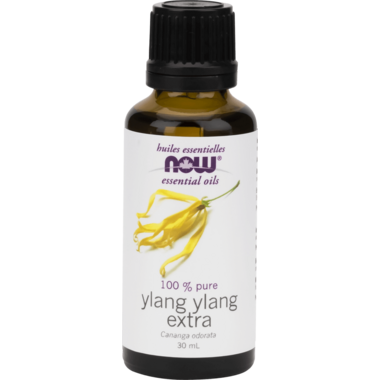 NOW Essential Oils Ylang Ylang Extra Oil is 100% pure, natural, and steam-distilled from mature Cananga odorate flowers. In the Philippines, Ylang Ylang means "flower of flowers". As one of today's most romantic fragrances, its flowers yield an exotic, aphrodisiac aroma that's cherished by many aromatherapists and perfume makers. Mixes Well With: Citrus oils, clove oil, jasmine, patchouli oil, rose oil. Caution: Caution: Keep out of reach of children. Avoid contact with eyes. If pregnant or lactating, consult your healthcare practitioner before using. Not for internal use. Natural essential oils are highly concentrated and should be used with care. Scent is heady. Like burying nose in a bunch of fresh flowers. It is sensual and earthy, reduces stress and is perfect for me. Thank you. A good distillation of Ylang. Sensual and heady, a sublimely sweet aphrodisiac and relaxing tonic that may reduce feelings of anxiety and stress as well as pain. It conjures up images of orchids and almonds. It is wonderful for hair and skin - particularly for blemishes. Thank you so much. This has a pretty strong but it is very pleasant. When they say extra they mean it! A little goes a long way so the price really isn't so bad in the end. Wonderful for making your own blends. I make a sleepy blend to diffuse in both my boys rooms that is a miracle! Definitely worth it to invest in full size oils and make your own blends...the possibilities are endless and its more economical! Such a beautiful smell which results in a feeling of joy, can be used for both oily and dry skins. One of my favourites.